With the upcoming holidays are you thinking of a road trip with dogs? 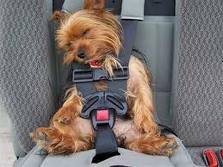 Chances are your dog has ridden in the car for trips to the vets, the park and visits at friends and relatives. Some dogs have anxiety over riding in cars. Has your dog been on a road trip before? 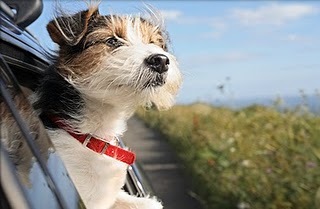 The more positive your dog’s automobile experiences are, the more likely he will enjoy the rides. that end up at the park or a walk in the woods. Try to make short trips with a reward at the destination or treat upon arrival. If your dog does not adjust to the car, then a road trip is not a good option. If you must bring your dog for a long car ride, ask your vet about possible anti-anxiety medications that can make the trip a bit easier on everyone. Plenty rest stops along the way while traveling with your dog, and plan to stop every 3-5 hours to allow your dog to relieve himself, drink water and stretch his legs.